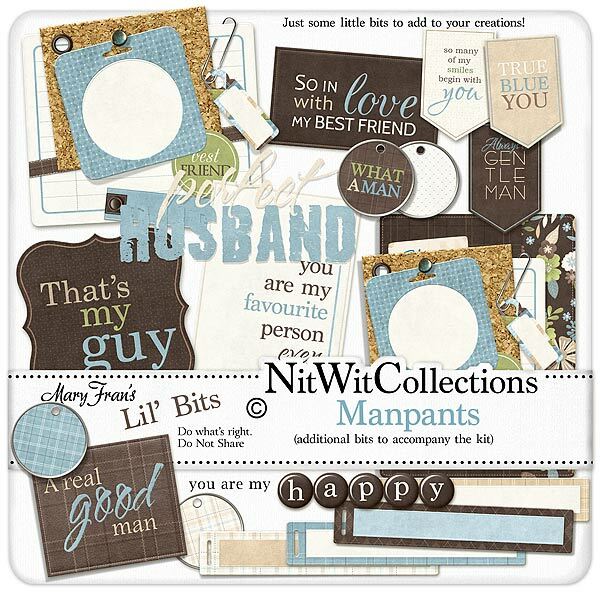 Lil' Bits "Manpants" include finished digital elements and journal tag items. They are more like when he says "Oh honey, I can build this for you!" We know how long we wait for him to get it done, and I didn't want you to have the same feeling so I finished them for you!. Don't miss out on these digital elements as they are not included in the ELS "Manpants" Collection so don't pass these by! 3 Circle tags - akin to little tags that you put on a key ring to remember what the key is for! 1 Circle tag - "What a Man"
1 Journal Card - "You are my...."
1 Label - " A Real Good Man"
1 Label - "That's My Guy"
1 Label - "So in love...."
1 Tab arrow - "Always a Gentleman"
1 Tab arrow - "True Blue You"
1 Tab arrow - "So many of my smiles....."
2 Toppers (both completely different)- the perfect singel digital element that you could simply use to make a complete card or digital scrapbook layout. How easy is that! 1 Wordart - "You are my Happy"